London - Zimbabwe's controversial president, Robert Mugabe, is the third-greatest African of all time. This is according to a survey for New African magazine announced earlier this week. The survey further showed that only Nelson Mandela and former Ghanaian president Kwame Nkrumah were regarded as greater leaders than Mugabe. The New African called Mugabe an "interesting" choice because "a high-profile campaign in the media has painted him in bad light". The London-based magazine said responses flooded in after the survey was launched in December to nominate the top 100 most influential Africans or people of African descent. Heroes of independence movements in Africa and African-American figures in the United States figure prominently on the list. Patrice Lumumba, Congo's first post-colonial prime minister, ranks sixth, followed by United States civil rights leader Martin Luther King. Pele, the legendary Brazilian soccer star, comes in 17th, followed by Jamaican reggae singer Bob Marley, numbering among those called "diasporans" by New African. Radical civil rights leader Malcolm X, at ninth, is a rank above United Nations secretary-general Kofi Annan, from Ghana, who comes just ahead of US boxer Muhammad Ali. Few women made the cut. The highest-ranked female, at 12th, is Winnie Madikizela-Mandela. Others include the dynamic duo of tennis, US sisters Venus and Serena Williams (together ranked 73rd), and ancient Egyptian queen Nefertiti at number 81. The magazine noted that most of the top 100 were from Africa's post-colonial period. "Have people forgotten Africa's history? Must this worry us, as a people?" it asked. Why is Richard Pryor not on this list? Oh wait, I forgot. Negroes built the Pyramids and brought civilization to the backwards Europeans and Arabs! Malcolm X was certainly respectable, in my opinion. From the writing and text I've read quoting him, he did know about the Jewish Conspiracy. He was very resistant and stubborn when considering foreign-racial assitance regarding his beliefs and movements. He praised the idea of a separate, sucessful African Community free of interference with others. Supported the "Back to Africa" movement also. It seems that he had a considerable amount of European admixture. Bill Cosby should also be included. Last edited by Vlad Cletus; Monday, August 30th, 2004 at 08:03 PM. Notice that despite the title of this thread, the list is for the 100 Greatest Africans. Even though Nefertiti was white, she was still an African. If the list was for the 100 Greatest Blacks, then Nelson Mandela wouldn't be on the list, seeing as how he's a Capoid, is he not? 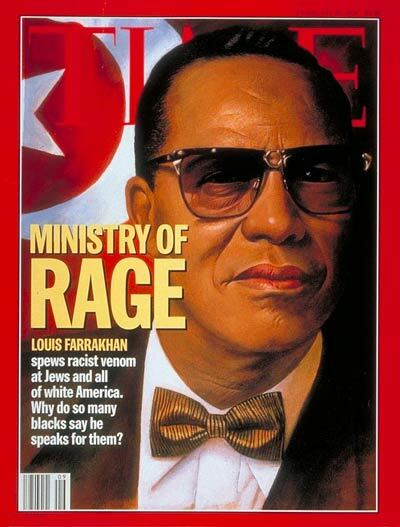 Louis Farrakhan is DA MAN! I feel slighted that the greatest of all living California Negroes, Rodney King, was omitted. They didn't include Bill Clinton?? He's the first black American president! He should be in the top ten.